I took a haitus from the blog last week because I was in Toronto. I stayed with a dear who treated me to wonderful home-cooked suppers. This aunt is Konkani, her family comes from the Konkan coast of Western India and so I got to eat some pretty awesome Konkani specialties. One night she made a simple supper of dal and rice but the instant I tasted it, I knew this was no ordinary dal. It turned out to be a specialty called Moong Dal Ghassi, a dal simmered with a coconut masala. Now coconut is widely used in Indian cooking as a base for vegetable, egg and meat curries, and grated coconut is often used a garnish for dry vegetable dishes. But a dal with coconut...now that is quite unusual to me. My aunt recited the recipe for me and I mentally noted it down and the very day I was back in NYC I thought I should try it out. Most Indians eat dal every single day and vegetarians rely heavily on dals for protein so it is hardly surprising that a vast variety of dals have evolved in the Indian repertoire. Punjab is known for dal makhani, Gujarat is known for its sweet dal, South India is known for its sambar and rasam. I'm happy to add Konkani moong dal ghassi to my list of favorites. 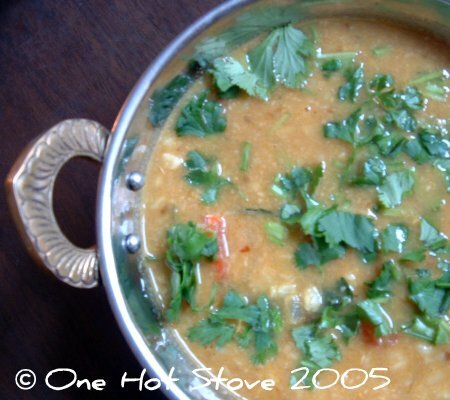 This dal has a complex and exotic flavor and is perfect served with some plain steamed rice. Cook the moong dal in a pressure cooker or the stove-top and set aside. Make the masala by toasting the ingredients together in the oil until fragrant and then grinding with a little water to make a thick and smooth paste. Set aside. Heat 1 tbsp oil/ ghee in a pan. Temper with mustard and cumin seeds. Then add curry leaves, onion and garlic and saute for 3-4 minutes. Add the dal, turmeric, salt, tomato, tamarind paste and masala paste. Stir well to mix everything together. Add enough water to get the dal to the desired consistency. Taste and adjust the balance of salty and tangy flavors. Simmer for 10 minutes on low heat. Garnish with cilantro and a squeeze of fresh lemon to add a fresh note. Serve hot. Hi Nupur - this sounds delicious! I hope to try it in the not-to-distant future. I've never cooked moong dal before, but I'd love to try it! Sounds really yummy. Gonna try it tomorrow! Excellent stuff! The coconut preparation sounds very similar to a Sri Lankan one called kalu pol, literally "black coconut." Coconut shavings are roasted with spices, rice is often included and then pounded with water to make a paste. It's then cooked in a variety of dishes with other spices. At home, we often cook a pumpkin curry this way, or very young, tender pumpkin greens inthis manner with jack fruit stones. Of course, Sir Lankan cooking is closely related to Sout Indian food. This recipes takes it a step further, I'm looking forward to trying it! we enjoyed yr recipes and the photos v much. pl keep up the good work. happy cooking. I am a konkani, and I do not think that this is the authentic ghassi recipe. Second, there may be various regional variations of ghassi, so I doubt there is one recipe written in stone as "ghassi". Feel free to share your version, we will all benefit from it! A Mallu family from Bangalore. I tried your recipe today and it came out very yummy. Next time I am thinking of frying tomatoes with onions as I don't like adding unfried tomatoes straight into the dal. Anyway, it is a great recipe. Thanks for sharing.